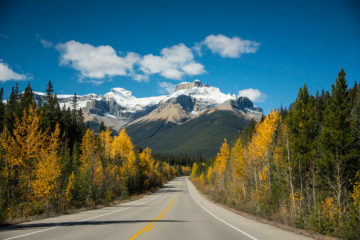 The United States of America is one of the largest countries in the world, covering a vast array of habitats from tropical wetlands to arctic tundra, and boasting an incredible collection of wildlife to match. Swimming with Florida Manatees is one of America’s greatest wildlife experiences. Large predators, including wolves, mountain lions and three species of bear, still roam freely in some areas. An impressive collection of marine mammals visit its shores. Alligators and Crocodiles roam the tropics while Musk Ox and Caribou tread the tundra. Though many large species have been systematically eradicated since the arrival of Europeans, there are still places where you can experience the incredible fauna of North America. Top Wildlife Destinations in the U.S. 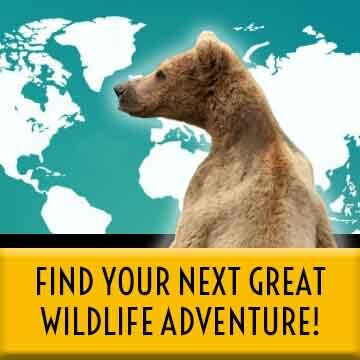 There are so many great destinations for wildlife watching in the U.S. that it is a challenge to select a top five. But here are five areas and parks that we consider the best wildlife watching destinations in the United States. 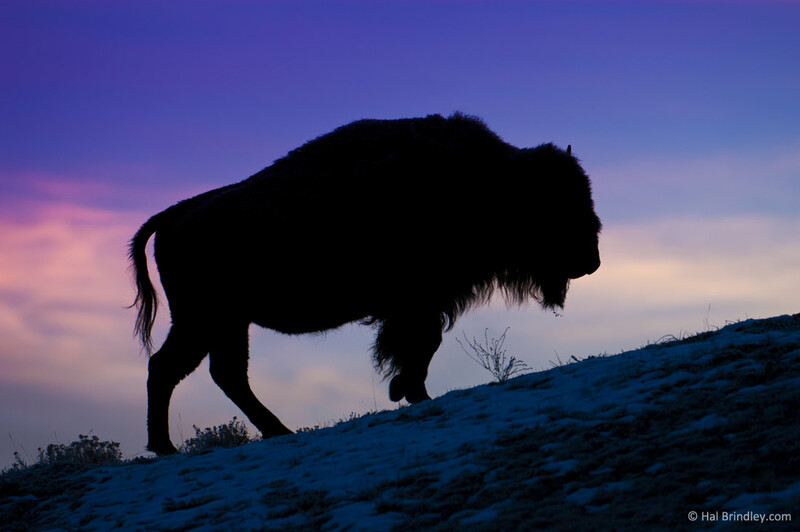 Yellowstone National Park reigns as the king of wildlife-watching destinations in the lower 48 states of America. It’s about as close as you can get to seeing how the country might have looked before Europeans arrived several hundred years ago, a place where North American megafauna still roam freely. Grizzly bears and gray wolves are readily visible hunting massive herds of elk. You will never forget the first time you see a wolf. It is a magical moment like no other. 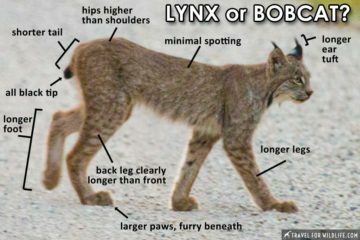 An impressive array of carnivores (mountain lions, wolverines, black bears, coyotes, foxes, bobcats, and lynx to name a few) prowl amongst an equally impressive range of prey species. 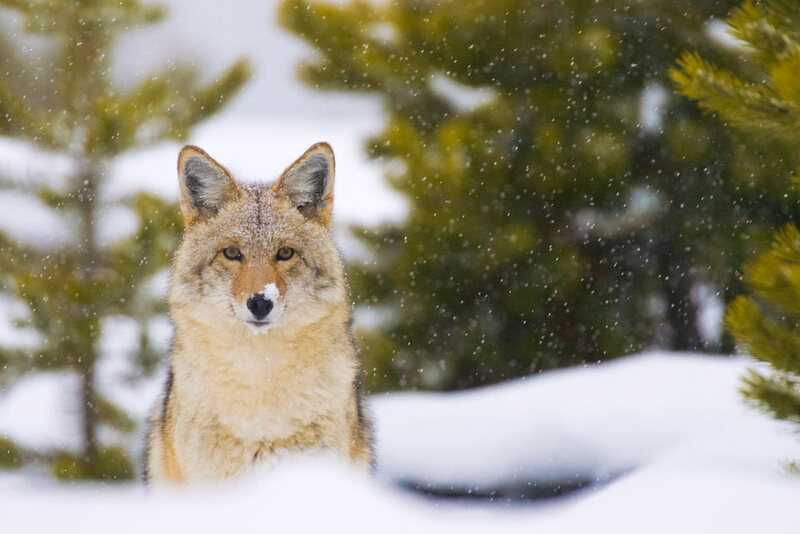 Winter is a great time for canid watching, including wolves, red foxes, and the inquisitive coyote (here). Large hoofed mammals include the largest of all North American creatures, the bison (named the National mammal of the United States), as well as moose, elk, bighorn sheep, mountain goats, pronghorns, mule deer and white-tailed deer. otters, beavers and muskrats ply the waterways while porcupines and martens scramble in the trees. Yellowstone is not only a great summer destination. Winter in Yellowstone is a dream. There are not many visitors in the winter and sometimes, it feels like you are the only one in the park. To visit in the winter you need to be prepared though. 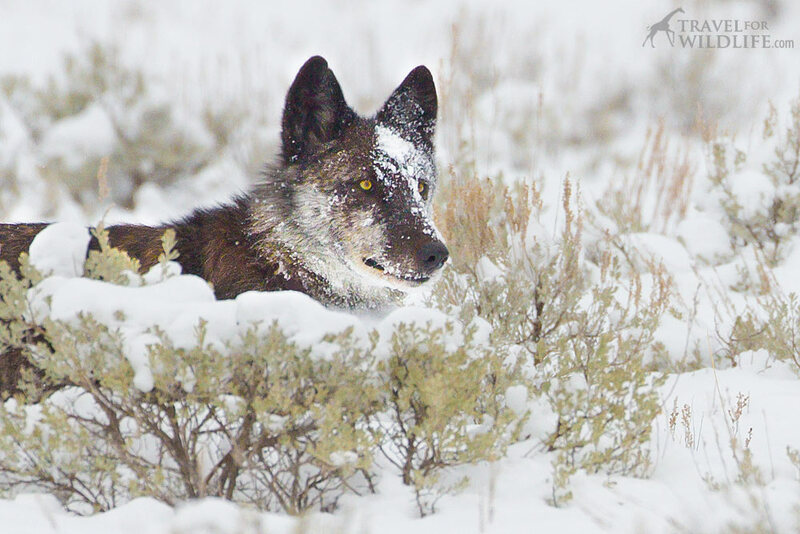 Read our A Guide to Wolf Watching in Yellowstone in the Winter to learn about what to expect and what you need. And don’t forget to get proper gear for your winter adventure in Yellowstone. Our Ultimate Travel Gear Guide for Yellowstone in the Winter will help your planning efforts. Hey, summer in Yellowstone is awesome too! Here is our take on our favorite place to stay in Yellowstone: Silver Gate & Cooke City. 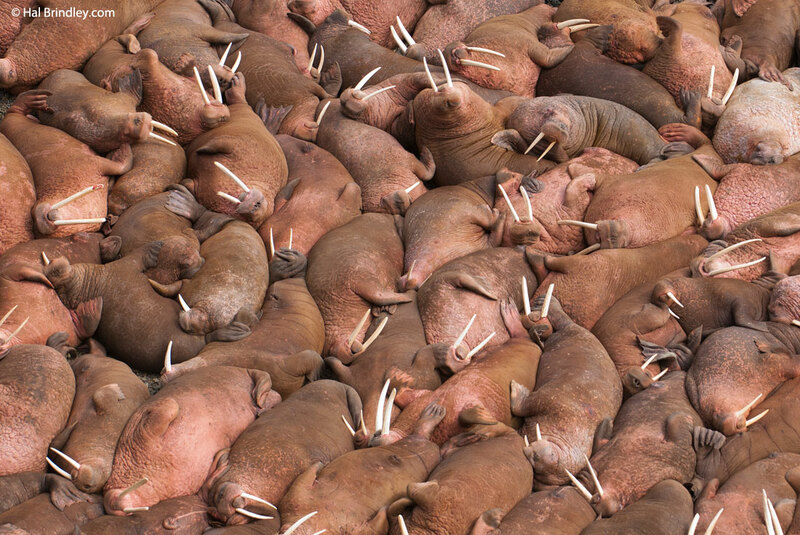 Camp on Alaska’s Round Island and watch thousands of sunbathing walruses. Alaska is America’s last frontier. Here you can find vast stretches of rugged untouched wilderness, stunning vistas and incredible wildlife. The Kenai Peninsula (Homer is a good place to start) is the perfect base for whale watching, sea otters and oodles of bald eagles. 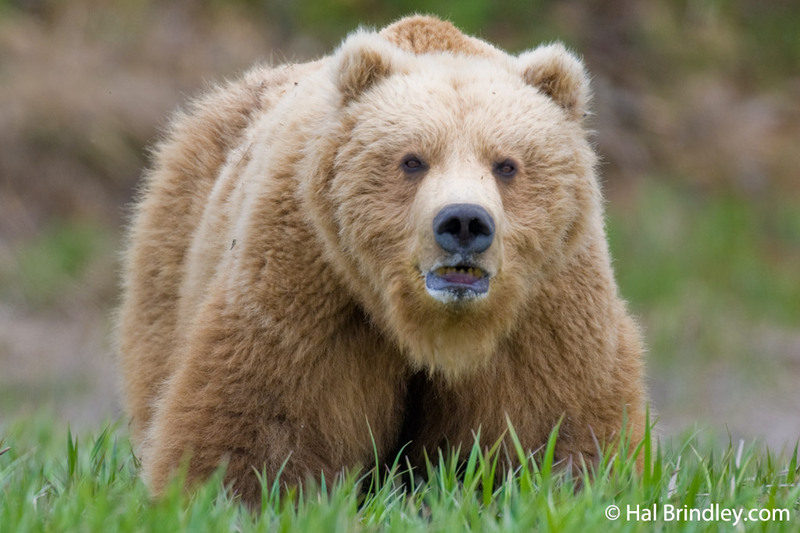 The Katmai Peninsula is known for it’s Brown Bears (Grizzlies). Mc Neil River State Game Sanctuary provides intimate bear watching but you must enter a lottery to visit. If you don’t win the lottery, head to Brooks Camp instead. If camping next to a thousand walruses sounds like your thing, catch a boat out to Round Island in Bristol Bay. But for an all-around amazing wildlife adventure, you can’t beat Denali National Park, where you can walk amongst wolves, bears, Dall sheep and caribou, and not see another human being for days. 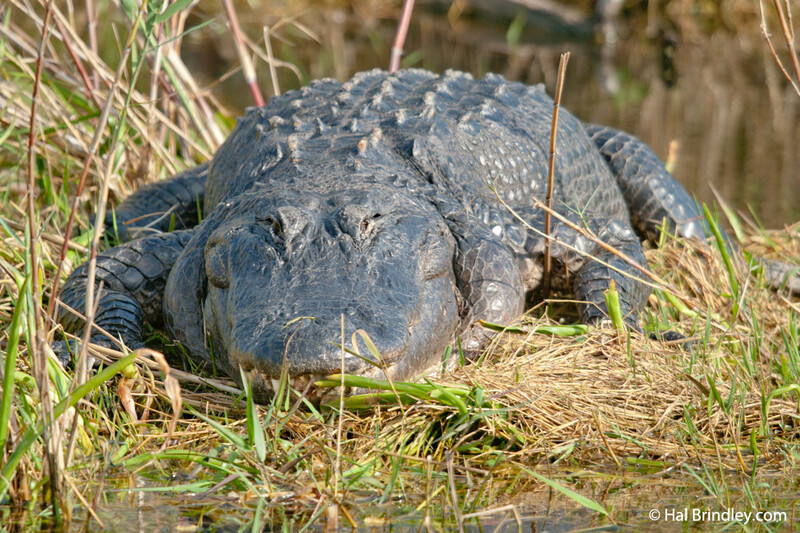 The American Alligator has made a stunning comeback in the Florida Everglades. If you’re hungering for a taste of tropical wildlife in the United States then head to Florida. Bird lovers should spend some time at Ding Darling National Wildlife Refuge on Sanibel Island during the winter where beautiful migratory wading birds like the Roseate Spoonbill are plentiful. Sanibel Island is also a perfect place to go shelling in Florida. 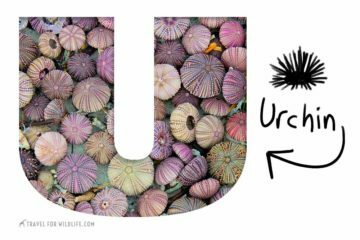 Before going shelling, please read our post Guide to Ethical Shelling. If you do go shelling, make sure that the shell you take doesn’t have a live creature inside. 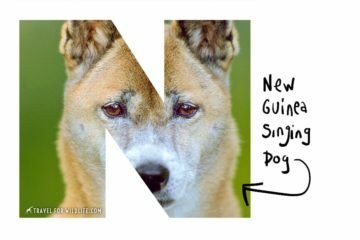 Here is our guide on how to tell. 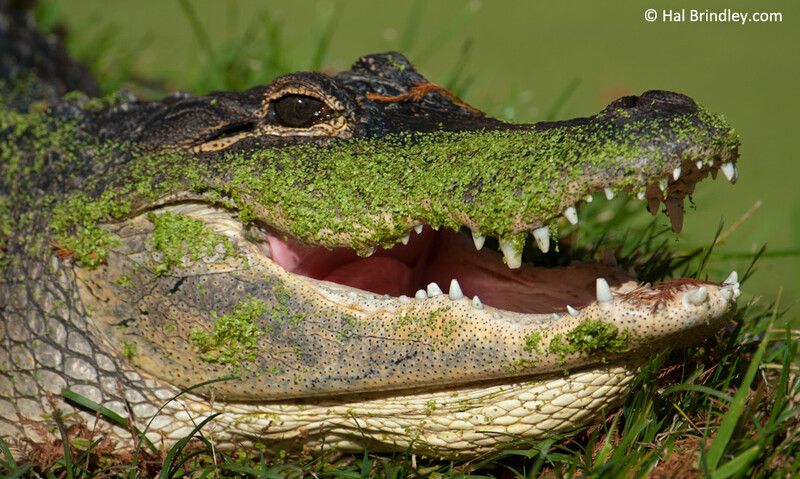 If reptiles are your thing, search for alligators in the Everglades National Park and maybe even catch a rare glimpse of the American crocodile at the Flamingo Visitor’s Center. And keep your eyes peeled for huge non-native pythons which are starting to make themselves at home. If you are heading to Key West, stop at Big Pine Key to visit the endangered Key deer, the smallest American deer. 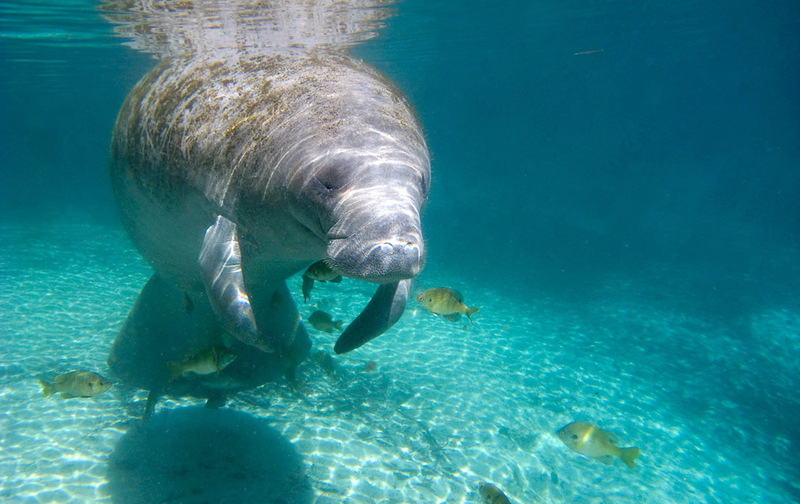 And our favorite wildlife experience of all is swimming with manatees in Crystal River. Cedar Key, on the west coast, is one of our favorite Florida places. This quaint corner of Florida is perfect for a quiet vacation and also perfect place to go kayaking with dolphins in Florida. 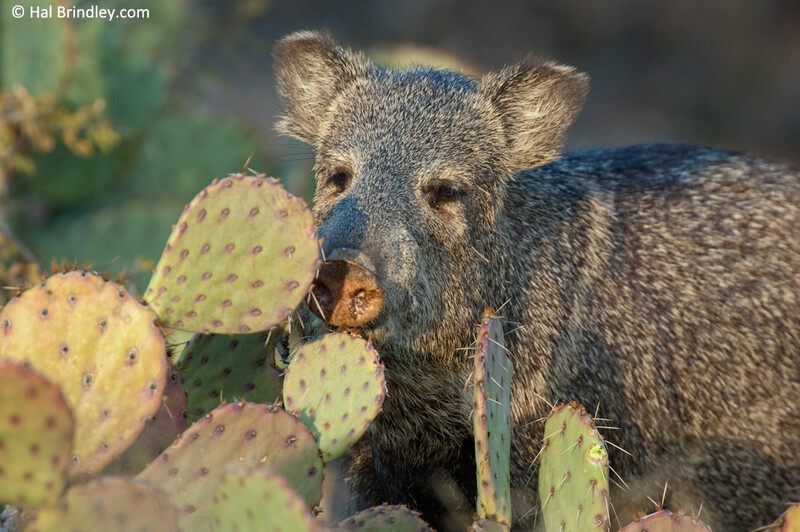 Watch Javelina’s munch cactus in the Sonoran Desert of Arizona. Road runners and wiley coyotes really do roam the deserts of America’s southwest. Stark and colorful landscapes are the backdrop to a cast of creatures specially adapted to the dry life. In New Mexico you can see thousands of snow geese packed together at sunrise in the shallow winter waters of Bosque del Apache NWR, or head down to Calsbad Caverns from spring to fall and see hundreds of thousands of Brazilian (aka Mexican) free-tailed bats emerging at sunset. Watch the last of the endangered condors soar over the Grand Canyon in Arizona and visit the Saguaro National Park outside Tucson to see javelinas munching on prickly pear cactus. And if you’re very lucky, you might catch a glimpse of the endangered Mexican gray wolf in it’s reintroduced range within the Apache National Forest along the Arizona/New Mexico border. 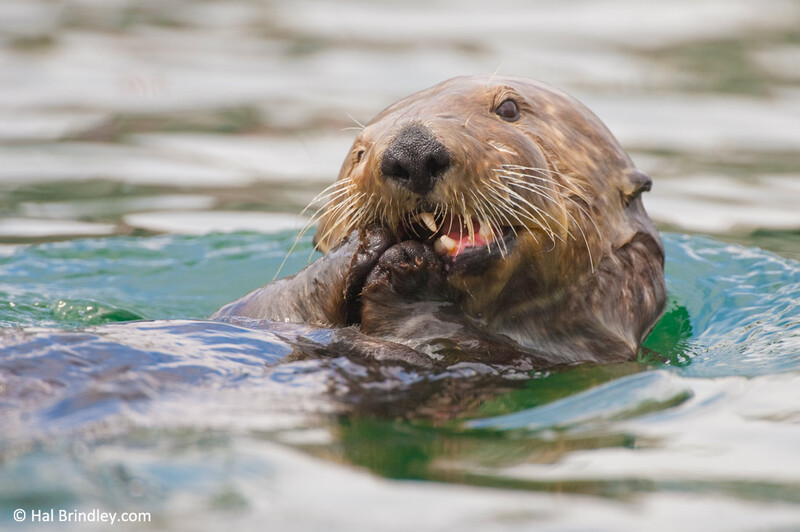 Watch Sea Otters up close as they dine on clams in Morro Bay, California. California’s coast is a paradise for marine mammal watchers. See the word’s largest seals, the Elephant Seal, in accessible colonies either at Point Reyes National Seashore or at the Piedras Blancas rookery. Visit Monterey Bay to find harbor seals all along the coast and visit a colony of raucous sea lions right on the jetty in Monterey. Morro Bay is an excellent place to kayak amongst playful sea otters and watch them cracking open their lunch upon their bellies as they float. The United States offers many famous wildlife-watching destinations but here are a few hidden gems you might not have heard of. The Alligator River National Wildlife Refuge in North Carolina is a little-known park that is chock full of amazing wildlife. Not only are black bear sightings virtually guaranteed, you can also see playful river otters and highly visible barred owls. And if you’re really lucky you’ll catch a glimpse of a member of the world’s only population of red wolves. You can join a red wolf howling tour too. But, yes, the Alligator River National Wildlife Refuge is the best place to see black bears. Antelope Island in Utah’s Great Salt Lake is another fantastic park that has stayed under the radar. This small island rests in the center of a sterile lake but is crawling with creatures including America’s largest animal, the bison. 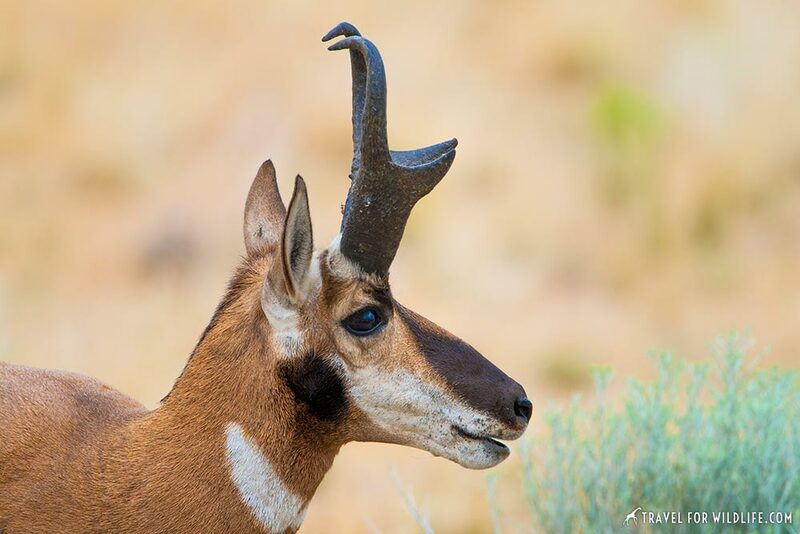 Other fun sightings include mule deer, coyotes, bobcats, badgers, porcupines, jackrabbits, burrowing owls, and the animal for which the island was named: the pronghorn antelope. Baxter State Park in Maine is known for more than beautiful forests and lakes. It is also home to one of the highest densities of moose in the country. The moose is the world’s biggest member of the deer family and a stunning sight to behold. Simply scan the waterways while driving or take a local moose tour out of Millinocket. 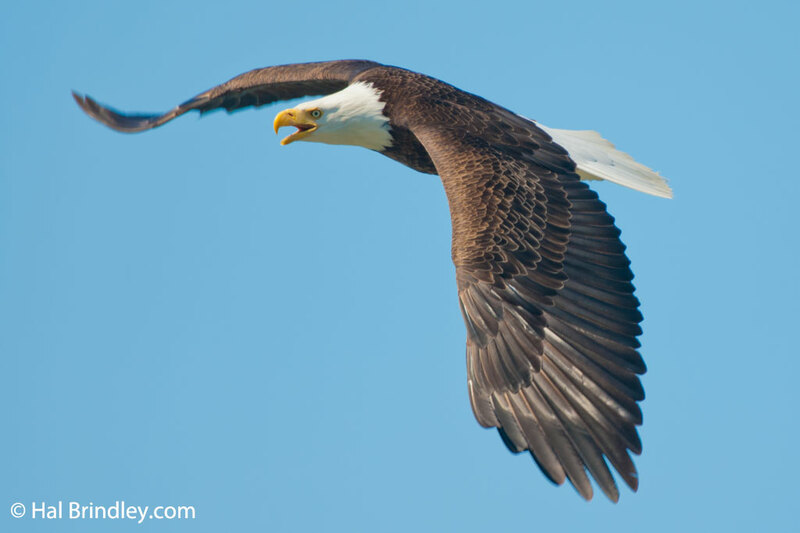 America’s national bird, the bald eagle. The USA is full of great wildlife watching adventures and its tough to pick our top five animals to see in America, but here’s our crack at it. These are some of the most impressive creatures you can see in the wild in the United States. No animal symbolizes the American wilderness like the Gray Wolf. Though it used range throughout North America, the wolf was systematically eradicated after the arrival of Europeans. Today the wolf has become a symbol of conservation and many groups are working hard to protect the remaining populations. 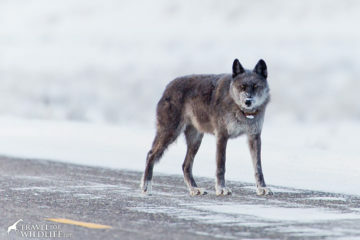 There are three main populations of wolves in the lower 48 states: one re-introduced population along the Arizona-New Mexico border, one in northern Minnesota-Wisconsin-Michigan (Isle Royale is a good bet), and another inIdaho-Montana-Wyoming. The best place to watch Gray Wolves is in Yellowstone National Park in Wyoming, where several packs are quite visible. The rest of America’s wolves can be found ranging across the great state of Alaska, and a visit to Denali National Park is likely to turn up some wolf sightings. If you’re interested in the highly endangered Red Wolf, visit the Alligator River National Wildlife Refuge in coastal North Carolina. It contains the only wild population in the world (<140 individuals) but your chances of viewing one are pretty slim. 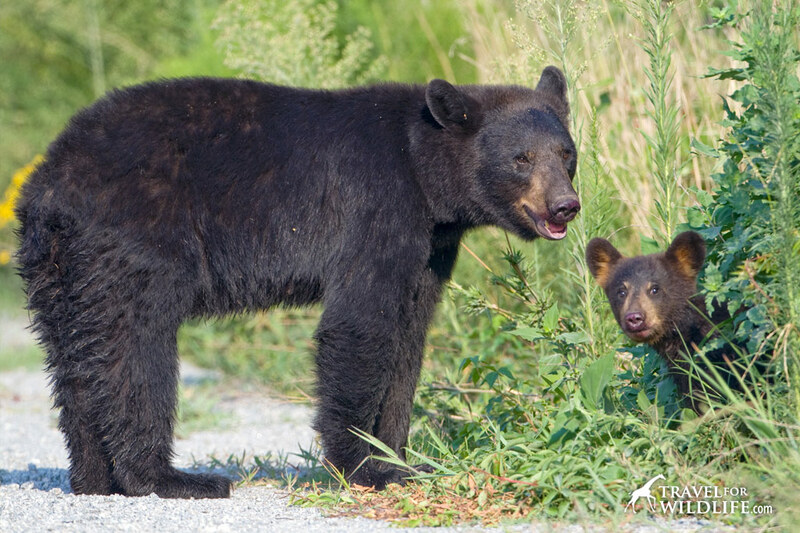 Our favorite place to watch black bears is the Alligator River National Wildlife Refuge near the coast of North Carolina. We’ve been there nearly a dozen times and have seen bears on every visit. 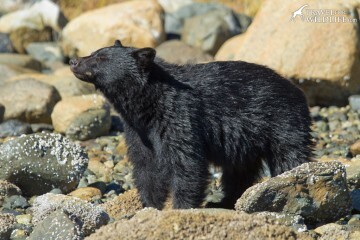 Another high concentration of black bears occurs in the Smoky Mountains National Park of Tennessee & North Carolina. Although you will see lots of bear-related advertising there, your odds of actually seeing a bear are slightly lower. Although it is quite possible to see Grizzly Bears (a subset of brown bears) in Yellowstone National Park, you need to travel to Alaska to see them in big numbers. Enter the lottery to visit McNeil River State Game Sanctuary for the most intimate bear watching experience or head to the viewing platforms during the summer salmon season at Brooks Camp in Katmai National Park. There are few places in the world where you can interact with a thousand-pound endangered species on its own terms, but Florida is one of those places. 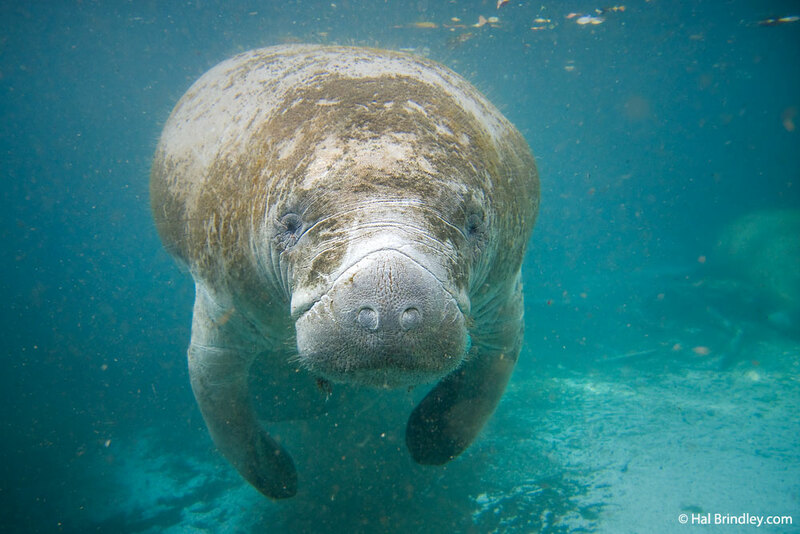 Here, in Citrus Country, you can snorkel with the West Indian Manatee, a huge and gentle marine mammal who occasionally likes to have its tummy rubbed. During the summer months, manatees are dispersed throughout the Gulf of Mexico and the southern Atlantic coast. It is during winter, when temperatures drop, that the manatees gather around warm water sources including natural springs and warm-water outflow from power plants. One of the best paces to see them is Crystal River, where over 30 springs keep the water at a constant 72 Fahrenheit. These springs provide refuge for around 500 endangered West Indian Manatees. In Crystal River you can rent a kayak or a boat and visit them at the springs where you are allowed to snorkel with them. There are also guided group tours. Go early in the morning before all the people arrive for a more personal experience. The Three Sisters Springs and King Spring are two of our favorite viewing areas. Our favorite place to view wild alligators is in the Florida Everglades National Park. Simply drive across Alligator Alley (Interstate 75) on a sunny winter day and you will spot large gators sunning on the banks of the drainage canal nearly every mile. The Anhinga Trail next to the Royal Palms Visitor center is an excellent place to safely watch wild alligators from close range. If you want to catch a rare glimpse of an American Crocodile as well, visit the marina near the Flamingo Visitor Center at the southern end of the park. There are few sights as thrilling as a pod of orcas hunting together like a pack of wolves, especially from eye level in a kayak. 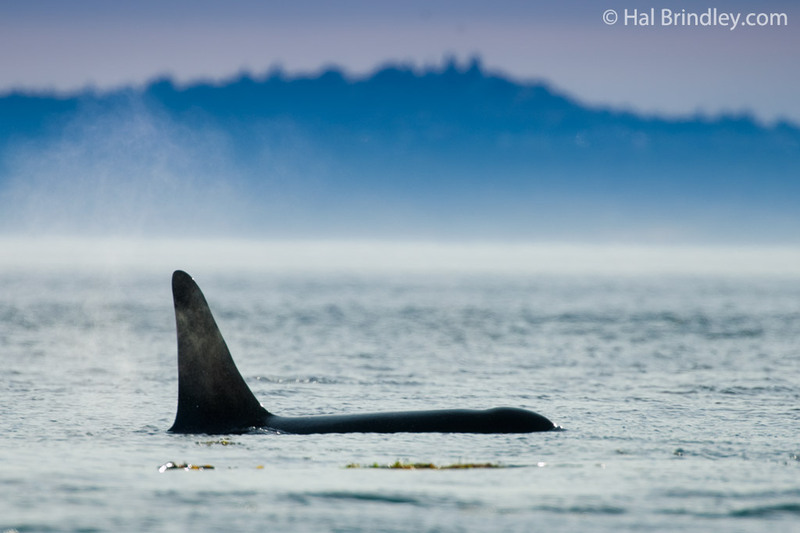 This is exactly what you can see in the waters around the San Juan Islands in Washington State. 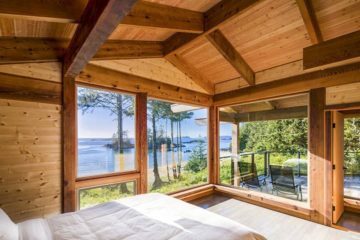 Take a ferry out to Friday Harbor on San Juan Island and either rent a kayak, go out on a whale watching boat, or simply drive across the island to Lime Kiln Point State Park and watch killer whales swimming right off shore. You also have a good chance of spotting Gray Whales during their annual migrations between Mexico and Alaska. A population of Humpback Whales in the north Pacific Ocean migrate each year between their winter breeding/birthing grounds in Hawaii and their summer feeding grounds off the coast of Alaska. Try choosing a whale watching tour from the island of Maui that adheres strictly to the rules of marine mammal engagement to avoid harassing them. To witness feeding behaviors in Alaska, take a tour from the Kenai Peninsula in towns such as Homer, Seward, or Whittier. Another whale watching hotspot is along the coast of Massachusetts (the town of Gloucester has several options). It focuses around Stellwagen Bank, a popular summer feeding ground for north Atlantic humpbacks.